This exhibition tells the story of their landmark lawsuit, Mendez et al. v. Westminster School District et al., and reveals how community organizing and grassroots activism can produce positive change in schools and communities across the United States. Experts have called this the most important court case about segregation before Brown v. Board of Education. Read about the case. The interactive exhibition provides a physical space where visitors can explore the case, its origins, and how its legacy inspired others to go on to make a difference. Click here to download a prospectus of the traveling exhibition. 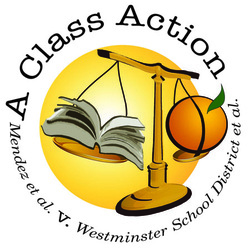 To receive a gift copy of the film Mendez v. Westminster: Families for Equality by Erica Bennett with a small donation, contact the Fullerton College Foundation at 714-992-7790 or info@foundationfc.com. For more information about the exhibition or how to lease the exhibition, please contact us.